Despite advances in surgical and chemotherapeutic options, patients with gynecologic malignancies continue to have poor survival statistics.1 This will only be improved when basic research translates into clinical practice and research focus is informed by actual clinical needs, believes Rébécca Phaëton, MD, assistant professor, gynecologic oncology, Penn State Cancer Institute. Dr. Phaëton and colleague, Nadine Hempel, PhD, associate professor, pharmacology, have started a gynecologic malignancies working group (GMG) at Penn State Cancer Institute to enhance interactions between clinical and basic researchers, and to utilize cross-disciplinary research resources, including pre-clinical disease models and clinical specimens, and patient data. Dr. Phaëton has a special research interest in cervical carcinoma; Dr. Hempel is a basic cancer biologist with a concentration on metastatic ovarian carcinoma. 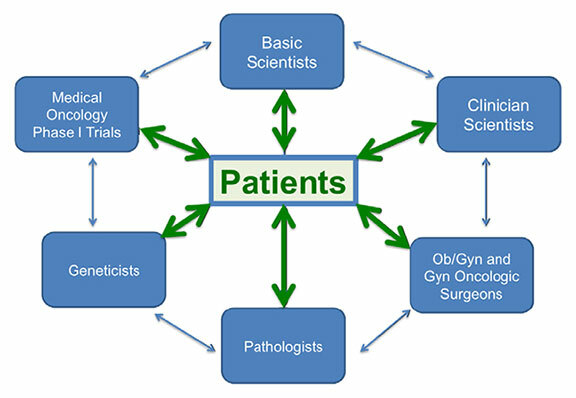 Dr. Phaëton points to the breadth of expertise in the GMG as a major differentiator, saying, “We don’t just have clinicians helping researchers procure tissue samples, we also have pathologists, social workers, epidemiologists, nurse practitioners and PhDs all working to improve care for patients with gynecologic cancer.” To ensure patient-centric efforts, patients are involved from the outset of every project with the hope that physician-patient interactions are enriched by novel agents and scientific approaches derived from the bench. All GMG specialists meet monthly to discuss basic and translational research projects and grant initiatives. “The GMG isn’t rooted in anything complicated. The emphasis on the effect of research on patient care starts with simply talking with patients—and listening to them. That’s what makes the working group reproducible across disease states, and hopefully, across the nation,” concludes Dr. Phaëton. She sees progress already, as the GMG has established tissue banking and ascites collection from women undergoing surgery at Penn State Health Milton S. Hershey Medical Center. To date, these samples have been replicated in the lab and are currently being studied to inform future research projects. In addition, she emphasizes that the formation of an active, collaborative GMG is critical to advance the understanding of disease etiology and the development of new treatment options for gynecologic malignancies. Read the OB/GYN Report to learn more about Obstetrics and Gynecology at Penn State College of Medicine and Penn State Health Milton S. Hershey Medical Center. FELLOWSHIP: Gynecologic oncology, Montefiore Medical Center and Albert Einstein College of Medicine, Bronx, N.Y.
RESIDENCY: Obstetrics and gynecology, Hospital of the University of Pennsylvania, Philadelphia, Pa.
MEDICAL SCHOOL: Marshall University School of Medicine, Huntington, W.Va.
POST-DOCTORAL FELLOW: Albany Medical College, Albany, N.Y.; Duke University Medical Center, Durham, N.C.
Siegel RL, Miller KD and Jemal A. Cancer statistics, 2015. CA: a cancer journal for clinicians. 65, 5-29. (2015). http://www.ncbi.nlm.nih.gov/pubmed/25559415. Accessed July 12, 2016.